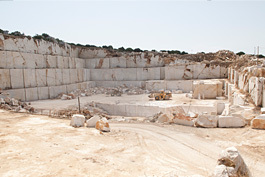 Sud Marmi has two own quarries in Custonaci, one in the Noce-Bellanova district and the other in the Viscardo district. 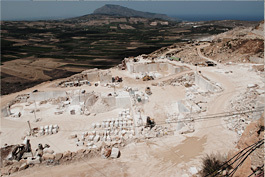 From these quarries through the use of cutting-edge equipment and machinery and thanks to the experience of the personnel employed therein, the blocks of Perlato di Sicilia and different types of Perlatino are extracted, such as the famous Cremino. Furthermore, Sud Marmi owns a large part of the area where the Diaspro di Sicilia marble deposit, commonly known as Libeccio, is a protagonist of the Italian Baroque and widely used in the construction of numerous churches and chapels of that period. We find it in fact in the Basilica of San Pietro in Rome and at Casa Professa in Palermo.